I have been debating whether or not I would keep updating my blog now that Luna is gone, but I selfishly have become very dependent on this process of writing. There is something so therapeutic about writing down what is going on because you have to know what you are feeling well enough to explain it. I thank all of you for taking the time to read this blog because part of this is just knowing that the people around me know what is going through my head. I don’t always articulate myself in person very well and sometimes the awkwardness of the moment makes me anxious. Being a pretty straightforward person, I have a hard time when I am expected to make assumptions in a conversation with someone. If I could trust everyone to just say exactly what they mean and be clear about their expectations in return, maybe I would be better at it. Anyway, long story short, I really am thankful for this opportunity to be open, honest and clear about how I am doing. In short, some days are better than others. It’s only been a couple of days, but already my emotions are proving to be pretty unstable. We came down from such a high on Friday night where we got to see our girl and had such a feeling of spiritual closeness to each other and God. Now we are being reminded of what we could have had if Luna was healthy and we miss it. It’s the little things really. I feel like I can handle the big things, but something as small as calling MJ “baby girl” can set me off because we had started calling her “big girl” in anticipation of the new baby. Or the smell of hospital on my clothes because it is so reminiscent of when I brought my other babies home. It’s kind of a testament to the tendency of the human heart to wander because it really takes very little to make me forget that there is a greater plan in all this. But if I take more than a millisecond to think about things, I feel peace knowing that our life is in the hands of a sovereign, righteous and loving God. I realize that I have already been blessed with more than I deserve and even if I never get anything I want from here on out, I will still rejoice because what I truly want is what God wants. And as we move from here, I will be able to post pictures of all the little things we are doing to remember our baby Luna and those things – even thinking of those things – remind me that my time without Luna and without my brother Jake is short compared to the time I will get to spend with them in heaven. Praise God for giving us these huge hearts with huge emotions so we can spend eternity pouring out our love and worship for him. It’s hard to write about our experiences yesterday. Not because they were difficult (even though they were) but because everything seems so hard to explain. We went into the hospital at about 8 and started the induction around 10. Even though I had delivered both of my previous children naturally with no pain medications at all, I found it very hard to motivate myself to relax through the contractions. With my previous deliveries, I could focus on that pink, chubby, healthy, happy newborn that would come at the end of all this pain and with this delivery, I couldn’t focus on anything at all. So I got an epidural, which was the first of many new experiences. Within a couple hours, Luna was delivered. It was so different from a healthy delivery. I will spare you the details, but what we saw could be considered grotesque by some. For us it was a beautiful and joyful experience. Yes, joyful. I can’t explain that except to say that it was all God. We knew that Luna had structural issues and a lot of fluid retention, so it was not surprising that she looked so different. She was discolored, swollen and very delicate. (Dr. A did a great job keeping her together during delivery. We couldn’t move her around much because she would literally fall apart.) Her skin was peeling and her nose and mouth were not fully formed. But to us, she was beautiful. We were prepared to feel grossed out or uncomfortable, but the only thing that kept going through my head was “How blessed are we that we get to see and hold our baby when so many others lose their babies before they get to?” I know for Patrick, the moment he got to hold Luna he was filled with joy. Here was this baby he never thought he would get to meet and he held her hand and felt her warmth before it dissipated. It doesn’t sound rational, but there truly was joy in the midst of our suffering. We held our baby and we held each other and we realized what miracles our two healthy children are. We recognized the miracle of our salvation and how Jesus died to save even our little Luna. We accepted the fact that God allowed this for us for a purpose and that our little family would be forever shaped by this short little life we held in our hands. In some ways, I feel like Luna has experienced life more than I have. It’s like she has climbed Mt. Everest, gone to DisneyWorld, won a Nobel prize and wrote the great American novel in her short life and I have so much to do to catch up. Holding her, I felt like I was holding someone who had taught me so much and who would continue to teach me. I felt proud of her…and I couldn’t stop smiling. Kim came and took some awesome pictures of the family and baby Luna. I am amazed at the sensitivity and tact that she showed taking pictures of our tiny, sick baby. I am glad we documented her in photos but I will never forget. How could I forget? We came home to our miracle babies today. I had a small breakdown in the car on the way because it was so strange to be coming home with no baby. But that was an accumulation of emotions that came from the ride in the wheelchair through the hospital. They were nice enough to keep us in the labor room so we wouldn’t be surrounded by baby noises, but we passed the nursery on the way out. I kept thinking that people passing me in the hall must be wondering why I don’t have my baby with me. I sat waiting for Patrick to pick me up at the entrance of the hospital and felt naked without a car seat on my lap with a baby making noises as they react to the outside world for the first time. There is such a finality in Luna’s situation now. I do not feel like I am forever waiting for the next ultrasound or waiting for that next movement or waiting for the doctor to give me news or waiting for the next appointment or waiting for the next step. Now I am waiting to see her again, but this is waiting that we are familiar with. Waiting for heaven. Who knows what the days and weeks to come will bring, but I am sure that God will surprise me. He always does. I have been staring at this screen for what feels like forever. There is no pretty way to say that we saw no heartbeat on the ultrasound today. We had prepared Bo for the possibility of not seeing a heartbeat and what that would mean. He was fascinated by the technology and all the colors on the screen. That helped to distract me just a little from the fact that I wasn’t seeing a heartbeat. The tech seemed every upset. I am not sure anyone prepared her. When Patrick asked about the heartbeat, she looked a little flustered and asked if it was okay if the doctor talked to us about that. I told her that was fine and that we have been preparing for weeks for this possibility and that it was okay. When she left, we told Bo that there was no heartbeat and that meant that Luna wasn’t alive anymore. He processed for a moment and then tears filled his eyes and he bawled. That was difficult, but we talked about how Luna was okay because her Uncle Jakey was up there taking care of her. He calmed down a bit and got distracted by the goo on my belly. We asked Bo to tell the doctor what we had told him and he told the doctor very confidently that Luna was in heaven now. That her body was still in my belly, but she was in heaven. We discussed some details and left. As we walked out the door, Bo picked up a floor mat and threw it against the wall. He said he was angry. Patrick and I joke that we saw him go through all the stages of grief in ten minutes. When he started crying again in the car, we asked if we could pray and make him feel better. This is what we prayed, “God please pick up our Luna and give her a big kiss for mommy and a big kiss for daddy. Please give her a big kiss for Maggie and a hundred kisses for her big brother Bo.” Bo didn’t believe that God had really kissed her at first, but eventually I think it made both him and Patrick feel better. I feel really backward today. David was a mess before his son died – fasting and praying and wailing, but when his son died, he got up and got dressed. So I feel backward because I am a mess today. And probably will be for a while. Thank God I can be surrounded by family now because a full house is a happy house for me. But in one of my sloppy moments, I was blubbering like a crazy person and Bo asked me why I was sad. I said it was because I wasn’t going to get to hold or kiss or meet Luna. God is good all the time. Even in this. Even in this experience and the heart-wrenching days and weeks to come. Even as I labor to deliver a baby that I won’t get to take home. Even as I recover from that delivery with no newborn to cuddle. God is good. And He will use this in ways I cannot imagine. I went through a phase when I was a senior in high school where I was certain I did not want to have children. I think my line was “I’d rather cut out my ovaries with a spoon.” At the time, I was determined to become a doctor and I knew a family would complicate that. I saw how tired my own mother was and in my self-absorbed way, I knew that could not be me. Fast forward a couple years and Patrick and I get married. I have decided that I don’t like the type of person I would have to be in order to excel in med school. (Cut-throat. Ambitious. Selfish. Self-centered. Successful at the expense of others.) And even while I have decided a family is something I want, I have decided I don’t want daughters. So I was sure a brood of sons would make sure I didn’t have to repeat that cycle with my own girls. Baby #1 was a boy. Success! There hadn’t been a girl in my immediate family since me 20+ years earlier. My younger siblings are all boys. My sister had two boys. I had a boy. I had changed twelve million diapers in my life and not one of them was a girl baby, until my Maggie Jake was born. 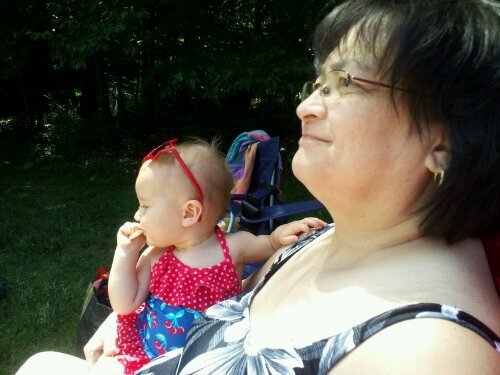 My beautiful mommy and her first granddaughter, MJ. With Luna, I think God is teaching me not to take any child for granted. I am always reminded of something my parents told me. In 1982, my parents just moved to the rural town of Taneytown and bought their own house. They had the perfect family: two girls and two boys. Everything was as it should be. They were feeling like they could be done having children. Until three-month-old Josh died of SIDS. I was born the following year. My parents had nine kids. And everyone always gives me a face and says something like “That’s a lot!” Yup. It’s a lot. My parents learned to value every tiny life God gave them because they know what it was like to have life taken away. And that’s about where I am. God gave me Luna just like He gave me Bo and MJ. All three are an important and essential part of the family and God is the one building my family. Not me. So if He decides that Luna doesn’t get to be born, I will accept it like I accepted the fact that Maggie is a girl. Luna is HIS baby before she’s mine. And for the record, girls are pretty awesome. I am incredibly fond of my nieces Lucy, Grace and Lolo Fe. My husband and I were talking about how strange it was that the cardiologist wasn’t more concerned about Luna’s AV canal. I mean, she has a large hole between the two lower chambers of her heart and then another large hole between the two upper chambers. Isn’t that something that should be devastating? Shouldn’t we be worried? How is her heart even working?! The cardiologist said that we shouldn’t be worried because they see these things all the time. They FIX these things all the time. It is a simple surgery and any cardiologist worth anything could fix it. Really? This devastatingly huge heart problem is not a big deal because there is an easy fix? Then my husband said something that really changed my attitude. He said Luna’s heart is broken like all of our hearts were once broken. And the fix is simple. The devastation of sin is real, just like the giant holes in Luna’s heart. Without help, Luna’s heart will stop working. Eventually, the blood in her heart will stop going to all the right places and her body will not get the oxygen it needs. Without help, sin will destroy lives. And we Christians see this all the time. We are not worried because the solution is simple. We see our God change lives all the time. It’s a simple surgery. Better than those cardiologists building Luna new chambers, God can build you a new heart. If Luna makes it to surgery, no…if she makes it to delivery it would be one INCREDIBLE miracle. And every time I find myself getting worried if Luna is even going to make it to the point where she can have the surgery, I think of the fact that everyone walking around with a broken heart is putting off their surgery. Did anyone ever tell them how simple this procedure is? Did no one tell them that our incredible God saw that we were unable to live lives free of sin on our own and made it so that instead we could just place our faith in a savior who could? A savior who did live a life free of sin, died a painful death on the cross for us and then rose from the dead in an incredible show of power, deity and grace? Christ’s death on the cross paid for our sins so that our broken hearts could be mended. My heart is whole and it is only because of this that I can even function under the weight of this Turner Syndrome diagnosis. You think my faith is strong? My God is greater. You think my burden is heavy? My God makes it light. How can I not be comforted by a God who lost his own child to save a worthless broken hearted sinner like me? And how cool is it that I am comforted in this possible loss of my daughter by a God who knows exactly what it’s like to watch his son suffer and die? Incredible. My God is beyond incredible. And he is in charge of this little life in my belly. When we visit the perinatologist at the high risk radiology place, we always leave with pretty grim news. We still praise God every time we see that tiny heart beating, and we always seem to end with the same conversation about trusting in the Lord. And we stayed true to this pattern. Luna was moving around more than usual which was pretty fun. Her swollen chubby legs and arms waving around to match the bumps and swishes I felt. The hygroma is still there and probably a little larger than the last time. The fluid buildup is pretty much the same if not slightly worse. But the most recent concern is her lung development (or lack thereof). The cardiologist on Monday described them as “nubbins” and the perinatologist said they were pretty nonexistent. This is a serious concern because for Luna to survive after any kind of delivery, she would really need those lungs. 1) Go home and check in again in two weeks, keeping in mind that a stillbirth is a distinct possibility. 2) Check into the hospital and go on full monitors in case the baby’s vitals drop, in which case they would do an emergency delivery. They would probably give me steroids to encourage lung development and Luna’s survival is unlikely in an emergency delivery with her current issues. 3) Check in the hospital and get steroids. Monitor the baby for a while and go home after a time if there are no significant changes. We chose to wait it out at home. Besides feeling really huge and getting run down and exhausted way easier than I like, I am doing just fine and don’t think being confined to a hospital bed is really the answer. 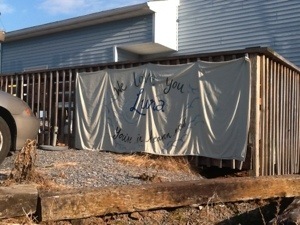 We understand the situation with Luna is pretty dire and that, in all likelihood, we will lose her in the coming weeks. Any efforts are last ditch. And according to the pattern, we ended the appointment by talking with the doctor about how we have peace knowing that God is in control and everything will go the way it should. Those were the doc’s words and we relished the opportunity to agree wholeheartedly. So, Luna will probably not survive delivery even if she makes it there, but we definitely know that she has a purpose in her tiny, short life and God is already using her in amazing ways. If God can use an unborn baby girl in such awesome ways, how much more should we be convinced that He has a purpose for each of us? Thank you all for your love and support. It means so much to us and we know that it would be very different without it. Please keep praying as the further along we get, the closer the end feels and the harder it is to keep our eyes on Christ instead of our own selfish wants and feelings.